Dentures are a popular replacement for missing teeth. Dentures are a removable dental appliance that are customized for your comfort and needs. Made to look like your natural teeth, dentures are an excellent cosmetic or functional replacement if you have lost all, or some of your teeth. Some reasons your teeth loosen or fall out can be found here. Partial denture – A partial denture is used in situations where some of your real teeth can be saved, and your jawbone can be preserved. A partial denture fits over your remaining teeth and use the gums, jawbone, and remaining teeth as support. Conventional (complete) – In the case that you do not have any teeth remaining, or your teeth are not healthy enough to restore and need to be removed, a conventional denture may be utilized. 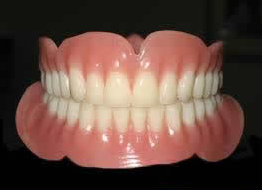 A conventional denture is custom-made and will be placed after your gums and tissues have healed. Sometimes this process can take several months to complete. Immediate (complete) – Like conventional dentures, immediate dentures are used in cases where the patient has no remaining healthy teeth. Unlike conventional dentures, immediate dentures are placed the same day as teeth are removed. You do not have to spend any time without teeth. However, there are many alterations and changes that may need to occur as your gums and tissues heal. Overdentures (complete or partial) – Designed for either complete or partial dentures, overdentures replace some or all of your teeth and are connected to dental implants. Overdentures replace the need for denture adhesives. Due to the durable material that dentures are made of, they will last for many years if properly maintained. However, over the course of time, they may need to be altered or restored in order to fix damage from normal wear and tear. – People who have lost all, or many, teeth within their smile. – People who want to improve the cosmetics and functionality of their teeth and smile. – People who want to ease the process of talking, chewing, eating, or digesting their food. If you have an interest in receiving dentures, Dr. Van Treese will discuss the process of receiving dentures in his next blog article. If you are in the Sidney, OH area and would like to schedule an appointment, or learn more about dentures, feel free to contact us at 937-492-6984.